Dr. Zachary Scoville began his journey into the chiropractic field when he was in high school. Being a varsity athlete in 3 different sports demanded a lot of his body. He discovered chiropractic care during this time in which he visited a chiropractor weekly which helped him reach his peak level of performance. Dr. Scoville carried his passion for athletics and caring for the human body into undergraduate college where he graduated from Adrian College in 2010 with a Bachelors degree in Exercise Science. Immediately following his graduation, Dr Scoville began classes at Life University in the Doctor of Chiropractic program. After graduating with his Doctor of Chiropractic degree in 2014, Dr. Scoville knew that his passion for caring for the athletic community had grown even greater. This gave Dr. Scoville the drive to solidify his passion for caring for athletes by pushing him to complete his Master’s Degree in Chiropractic Sports Science from Life University in 2015. During the time he was completing his Master’s Degree, Dr. Scoville was hired by Life University to work in the Sports Science Institute. He was also selected as the sole chiropractor for the D1A USA Rugby National Championship game. These combined experiences allowed him to gain valuable knowledge and experience in caring for and managing the complex injuries that athletes are faced with throughout their athletic career. Dr. Scoville specializes in athletic injuries. 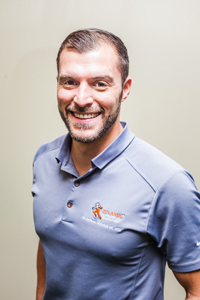 Certified as Chiropractic Sports Physician and currently becoming a Certified Chiropractic Extremity Practitioner, Dr. Scoville utilizes a form of assessment on each athlete that tests their muscle control via the nervous system both before and after his adjustments. This gives the athlete real time feedback of the positive changes that are occurring within their nervous systems control of their muscles. This allows the patient to feel the immediate increase in both strength and speed of their muscular response globally. He then focuses his assessment to any areas of the body which still contain inefficiencies, caring for them from a local stand point. This is where Dr. Scoville utilizes his expertise in extremity adjusting and myofascial release to help the athlete’s body recovery and prepare itself for peak physical performance. Dr. Scoville is also certified in Active Release Techniques ( A.R.T) and is a certified RockTape doctor. Dr. Scoville’s expertise and practice techniques have led him to gain the trust of professional athletes ranging from the top contenders at the CrossFit Games to professional race car drivers.